The cuckoo sings out a rhythm to accompany our steps. The only other sound apart from the bird’s tick-tock song is the soft crunch of our feet on pine needles. It’s a beautiful morning and the tall pines provide dappled shade from a sun that would make the 1000m ascent gruelling otherwise. There’s a slight movement in front, a shrew scuttles amongst the twigs on the path. He stops when he spots us but doesn’t run, instead he observes us with curiosity. We leave him to his scuttling and we climb higher, passing only a farmer with a tiny trailer loaded with firewood. It seems remarkable that a few kilometres along the trail we may face a wall of snow and have to turn back. But we won’t know for sure until we reach the refuge. Although it’s the end of May, snow has lingered longer this year. The trail would normally be fine, this year there’s a huge question mark. Even as we climb we see evidence that snowy forests might be pretty to look at but they can be dangerous places. 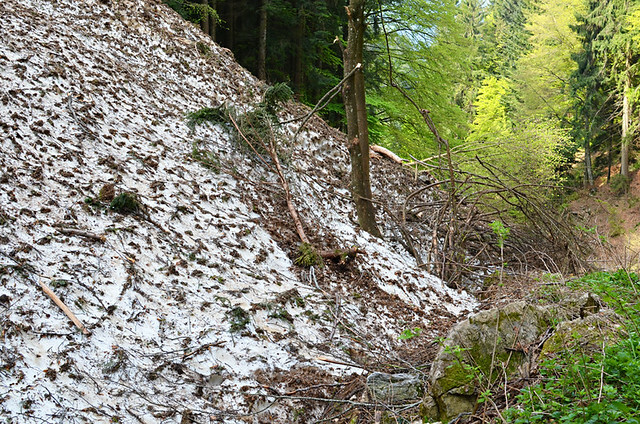 The remains of an avalanche spills across the path; a dirty mix of snow and broken trees. We break free from the tree line at a small malga (farmstead) where the pine curtains are pulled back to reveal a glorious landscape of soft valleys and serrated peaks. There isn’t much snow on the nearest peaks but in the distance the mountain tops are still dominated by white. The terrain opens up more and perky crocus rather than snow decorate the slopes around a saddle where a multitude of paths converge. There’s an air of rebirth. Everywhere is fresh and shiny. Then we turn toward the refuge and the side of the mountain still largely ignored by the sun’s warmest rays. 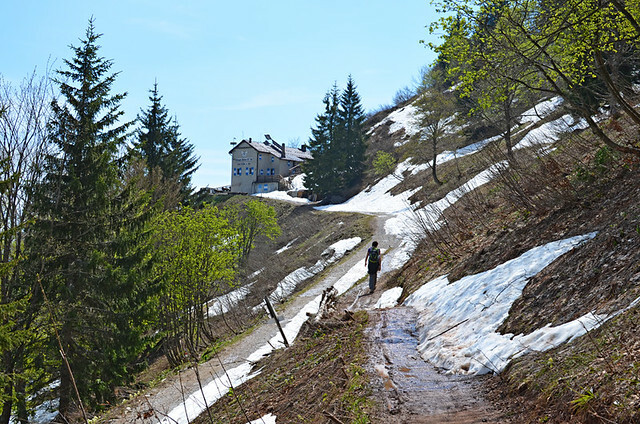 Small snowdrifts melt onto the path, making the ground muddy and wet as we ascend the final few metres to Rifugio Pernici. Suddenly the world feels different. Spring hasn’t quite won the battle of the seasons here and thicker drifts embrace the refuge’s generous wood supplies. It’s still tee-shirt warm; warm enough to sit outside the refuge on benches with misty mountain views that detain you far longer than you plan. Inside a fire roars. We order coffee and baguettes and ask the young couple running the refuge if the path will be open. The answer is definitive. 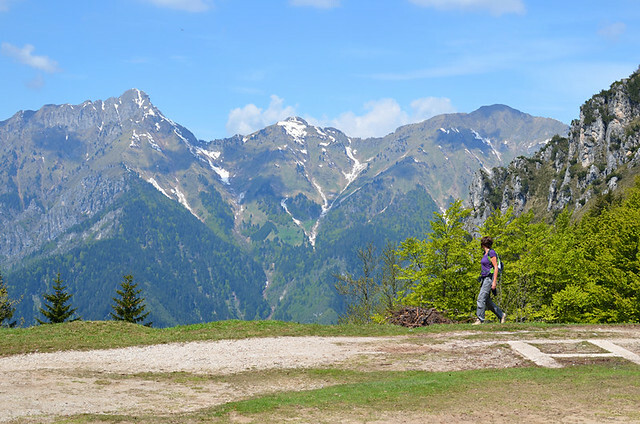 The girl sits on the table and shows us an alternative route to skirt the Cima d’Oro, descending back to Lake Ledro via its sunnier southwestern slopes. “It still might be risky, but walkers have taken that path and haven’t returned,” She smiles. That doesn’t mean they made it, there might be a mountain of broken walkers buried beneath a snowdrift for all we know. The girl is delightful, all big eyes and smiles. We ask a couple of questions and she plonks a huge book in front of us, enthusing about the stunning photos inside (taken by her father in law). We learn a lot. How they like to celebrate New Year at the refuge; how much snow ends up carpeting the roof, what flowers bloom at various parts of the year and what birds strut their stuff about here. She also tells us about the past; this was the Italian/Austrian border and troops guarded these parts during the First World War, staying warm (ish) in caves along the route we’re about to take. 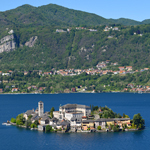 We could chat forever in this warm and very welcoming beauty spot but we have to move on. A young couple with a baby in tow are in front of us. If people with a baby can manage the route things can’t be bad. They turn back after a couple of hundred yards. 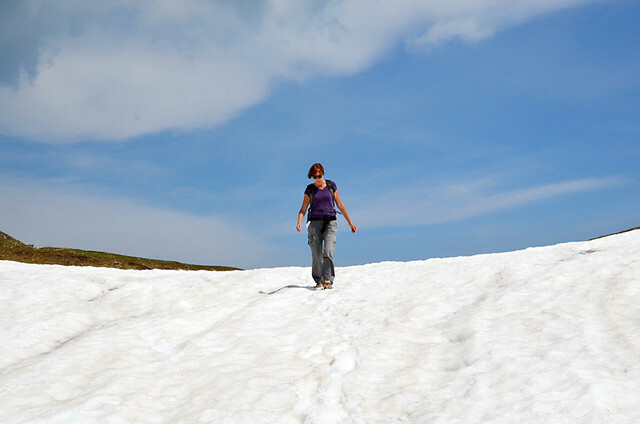 The path skirts the steep hillside where the occasional snowdrift is thick enough to crunch over confidently. 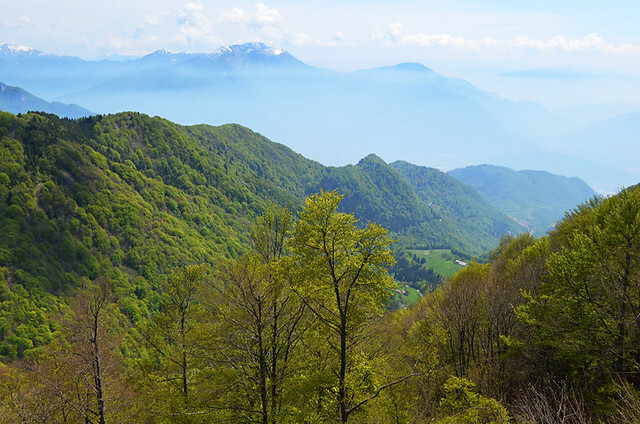 However, as we head toward Cima d’Oro the drifts become steeper so that there is no path, only a slippery slope that goes all the way down. 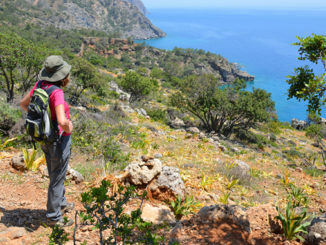 Some are more difficult to negotiate than others and a taster why the route ahead is too dangerous. As we cling to spindly looking tree roots, praying they’ll hold long enough to get us across one particularly precipitous snowy slope, we remember this is the ‘safe’ section. 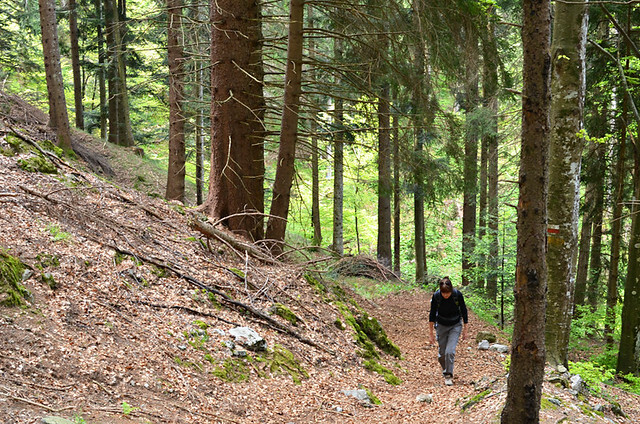 It’s a relief to reach the small valley at Bocca Saval where we part company with the dark side of the mountain. 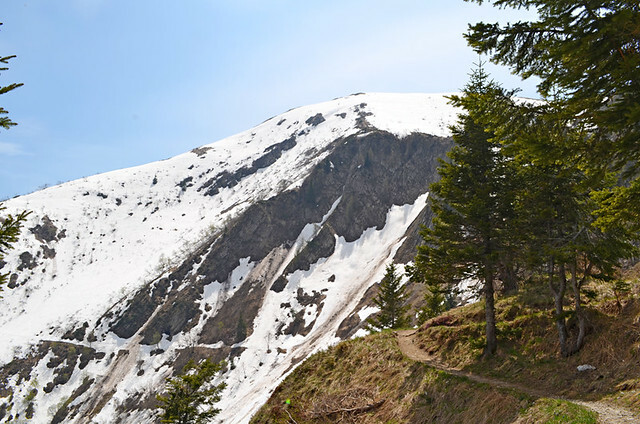 There is still plenty of snow on our route, completely obscuring trails so that some guess work is required, but it is flat and fun to walk on. 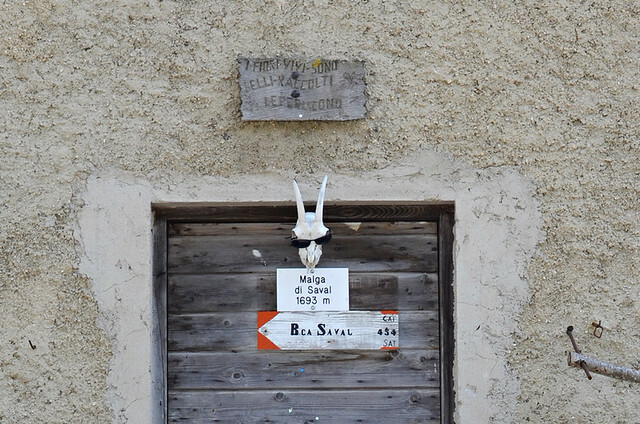 We pass Malga Saval where sometimes you can buy cheese. It’s still closed, the only inhabitant a goat skull wearing sunglasses. 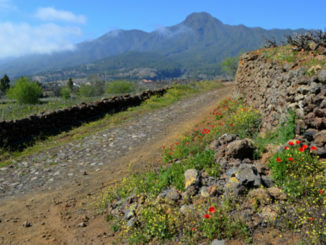 Immediately the trail begins to descend and the snow disappears to reveal the path through a valley full of spring flowers. The hard part is over. 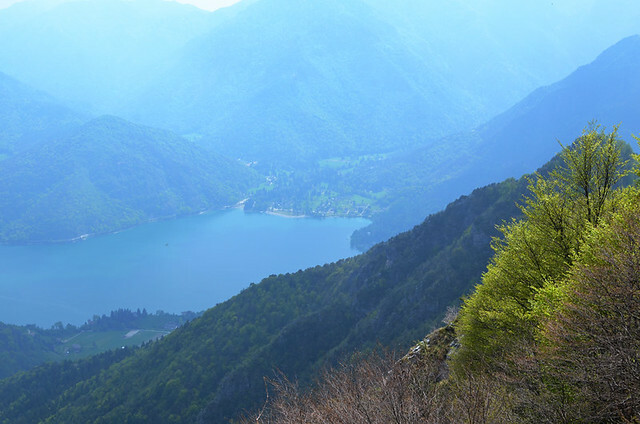 From now it’s all downhill with views of the high mountains being replaced by sight of a misty Lake Ledro, a vaguely sparkling pool way, way below us. From here it’s easy. We can relax and enjoy the fact that our path is open and we don’t have to retrace our steps all the way back to our starting point.